We're members of these professional associations. Founded more than 30 years ago by Bevi Chagnon, PubCom today provides a full suite of services to help your team create and publish. We help you take advantage of the latest technologies to get your message out to your audience as efficiently and effectively as possible. And fully Sec. 508 accessible, too. Since the early days of desktop computers, PubCom has worked with the major software manufacturers on the development of the "household name" programs that are on your computer today. Today, many of our employees and associates are certified in Microsoft and Adobe software programs. No matter if you publish via digital media, web, or traditional print — or a combination of these cross-media technologies — we have you covered. Everything we do is 100% accessible. We've been doing "accessibility" for a long time. PubCom worked on the development of early prototype screen readers in the mid-1980s. We continue our commitment today by contributing to the international accessibility standards. Accessibility isn't an afterthought for us, something that's done at the last minute before your message is published. 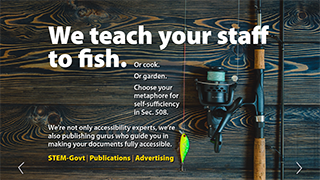 Instead, we help you build in accessibility right from the start to create the most accessible versions of your documents at the least cost to you. Our employees, contract specialists, and strategic partners are the best in the industry, dedicated to sharing their expertize with you. We like teaching people how to fish. That knowledge will last you a lifetime. We teach what we do. In addition to our design, development and Sec. 508 remediation services, we spend a good portion of our time teaching you how to do it through our classes, on-site customized training, consulting, and technical support. See our short slidedeck about how we help publishers. In 2017, we launched our publishing subsidiary, PubCom Media, to publish our self-help DIY books on how to make accessible documents. Our authors are the best brains in the industry. Their books take you step-by-step through the process so that you become self-sufficient in making compliant PDF and MS Office documents, as well as Adobe InDesign layouts. Visit our online bookstore. Our motto: We want to work ourselves out of a job. It's true. We want to train and advise you so well that you become fully adept at making accessible documents and don't need us again. Good thing we love what we do because with a motto like that, we're not going to retire any time soon! Drop us a line when you want to fish. Or make accessible documents. We have more than 200 combined years of experience in the publishing, marketing, and accessibility industries. Our street creds in brief. We're located in Takoma Park, MD in the metro Washington DC area.